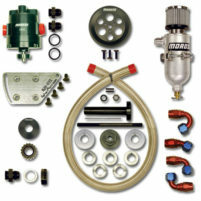 You Are Here: Vacuum Pump Kit & Regulator. These -12AN vacuum pump mounted regulators are available individually or as an upgrade on our vacuum pump kits. Manufactured from 6061-T6/651 aluminum and color anodized, they mount directly to a MOROSO or AEROSPACE vacuum pump with -12AN fittings. Unlike the standard vacuum relief valve, which is a constant leak at all vacuum levels, this regulator only draws in ambient air when the set point is reached. This could help reduce some of the smoking associated with the standard vacuum relief valve at idle and lower engine speeds. Also available is an In-Line version that can be placed in-line between the engine and the vacuum pump. Ideal for situations where mounting the regulator directly to the vacuum pump is not advantageous. When regulator set point is reached, ambient air is drawn directly into the vacuum pump helping it run cooler. By placing the regulator “outside” the crankcase area, the excess air the regulator is bypassing will no longer be passing through the engine to the pump. It now flows directly into the pump, reducing the possibility of oil being scavenged from the engine. Mounts directly to the vacuum pump. 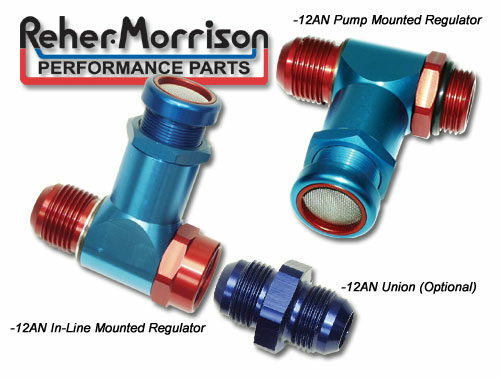 No need to drill and tap head or valve covers, or weld in a bung to accept the regulator. Regulator may be rotated 360° for ideal positioning. Infinitely adjustable. No springs or shims to “fool” with. Screened inlet keeps dirt out of your pump and out of your engine.